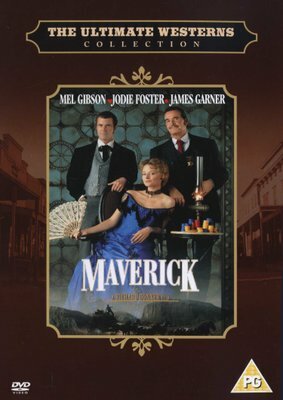 Mel Gibson is sly gambler Bret Maverick, Jodie Foster is a charming scam artist and James Garner (the original Bret Maverick from the Emmy-winningTV series) is a laid-back lawman in Maverick, the crowd-pleasing hit that deals you a winning hand. With more twists than a switchback trail and more sleights of hand than a shell game, Maverick is rollicking proof of how the West was tun. A riverboat poker tourney promises a winner-take-all $500,000 ... and Bret aims to be the winner who does the taking! 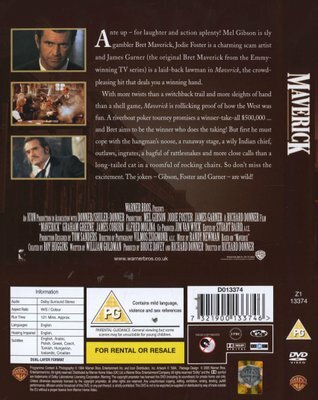 But first he must cope with the hangman's noose, a runaway stage, a wily Indian chief, outlaws, ingrates, a bagful of rattlesnakes and more close calls than a long-tailed cat in a roomful of rocking chairs. So don't miss the excitement. The jokers - Gibson, Foster and Garner - are wild!